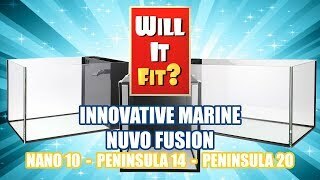 The Fusion Nano 10 is the most popular aquarium in Innovative Marine's NUVO Series. 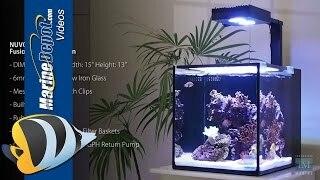 We've provided 3 of our favorite nano reef lights to choose from for this tank build. Each light is sleek, powerful, and controllable. The Fusion Nano 10 fits Innovative Marine's AUQA Gadget "DeskTop" lineup of tank upgrades and accessories perfectly, so we've include some of our favorites to help you keep the water clean and chemistry more stable. Sophistication and style now in a nano size. Build a welcoming environment for yourself with the most advanced AIO aqiarium in its class. 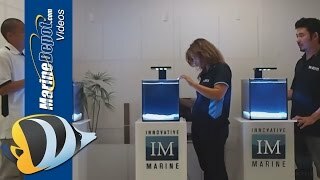 Keeping in line with the features of their award winning successor, the Fusion Nano 10 & 20 has generous display space for aquascaping and a redesigned filter wall for current and future Innovative Marine products in mind. By raising the bar on what comes standard you get to live large in a small space. Nice little tank that has a wide variety of accessories that can be added on. Great for beginners and advanced fish-keepers. Received my tank in great condition. The quality for the price you are paying is hard to beat. Highly recommend it. I bought this to be a nightstand tank next to my bed, not sure what the quality would be like for $100. The tank blew my expectations away as the build quality is amazing. Definitely worth the money and more for anyone looking for something small, sleek, and appealing. This nano is perfect for small spaces. I wanted a bigger tank but considering I have very limited space, it was either the evo 5 gallon, or this one. All I can say is I’m glad I went with my instincts..
One of the best options for a nano tank. Cool little tank very clean appearance. Looks great on my desk.